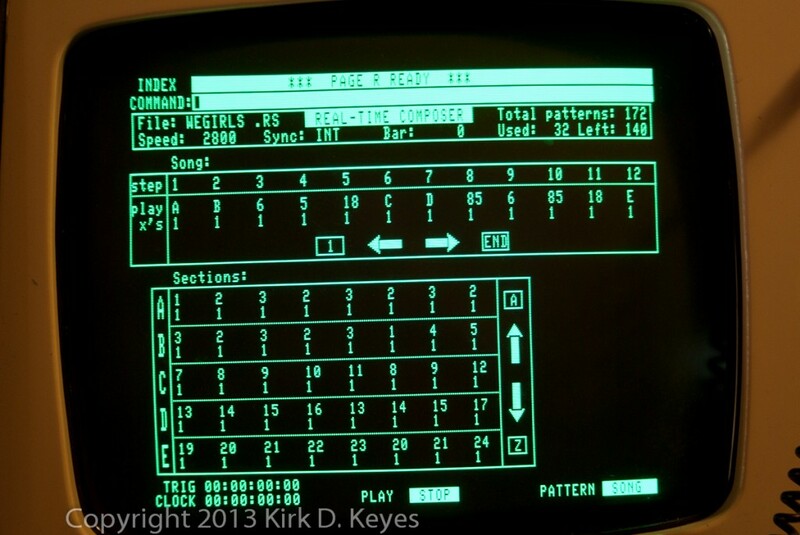 Here’s a basic output of the PSB WEG disk that I have. It’s all 8 channels being sequenced in Page R and then recorded into the computer and mixed together. 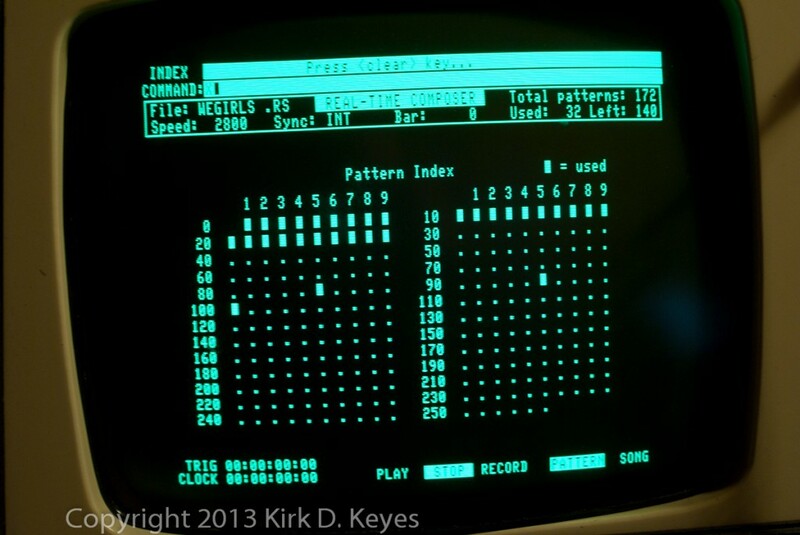 No effects, no nothing – just the basic output of the Fairlight sound channels converted to a WAV. 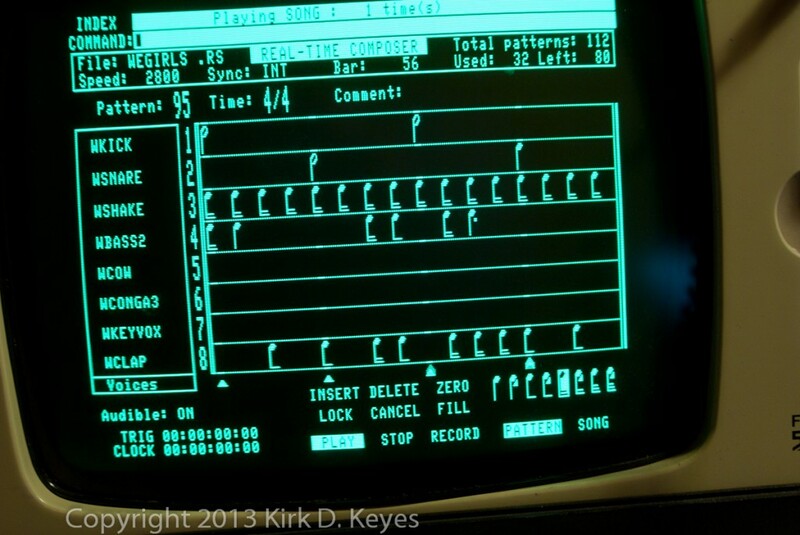 There’s some noise in there – I think it’s from the bass drum channel on the Fairlight. I need to track that down. There was no Control file (.CO) on the disk, so I don’t know if there was supposed to be any fine tuning or envelope controls applied to the samples. 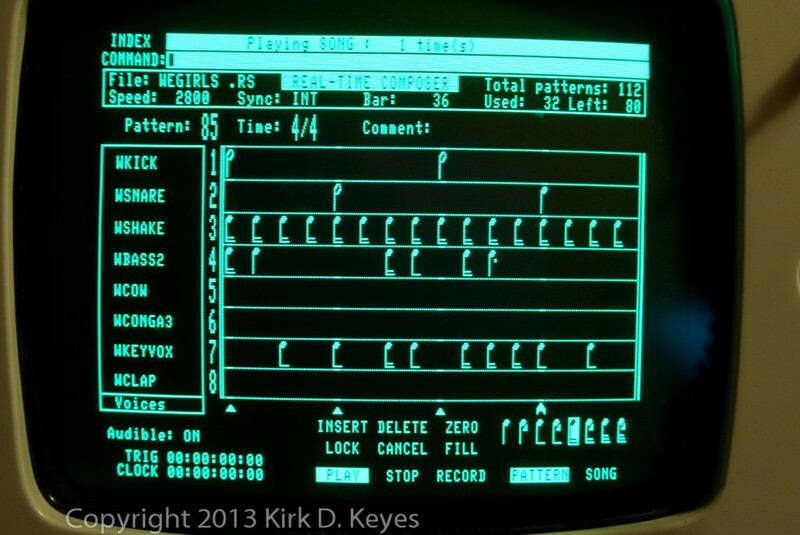 I just loaded them up and fired up the sequencer and let it run! Page 2 with file info on the disk. All file types are .VC (voice) and .RS (Page R Sequence). All the voice files contain samples, except WTAMB2.VC which is blank for some reason. Here’s the structure of the first half of the song – you can see there are 32 bars (measures) used in the sequence, the sequence has space for 172 bars, so there are 140 bars that are unused. Steps in the sequence can contain either the info for a bar or a pattern. Patterns are denoted by listing the pattern number for single bar patterns and multi-bar patterns are shown with a letter designation. The pattern number can go up to the maximum number of patterns in the sequence. There can be up to 26 multi-pattern sequences made up of up to 8 patterns, with the sequences labeled A through Z. Each pattern can be repeated multiple times. 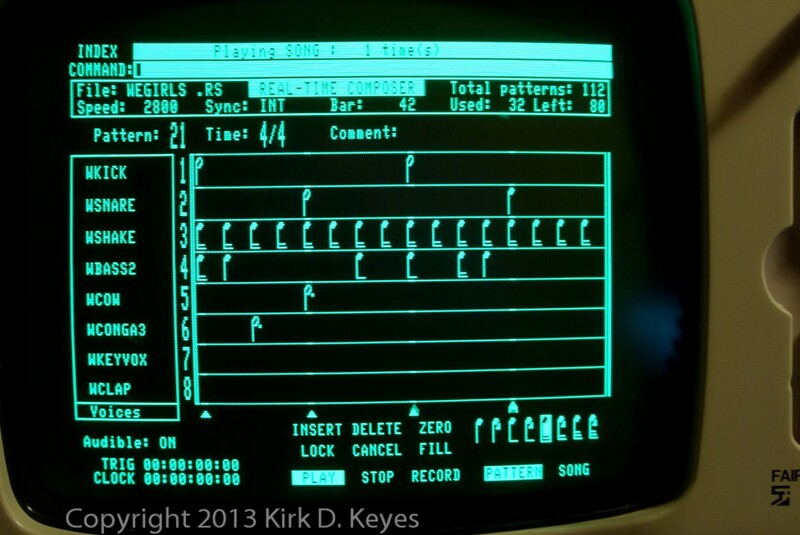 You can see how powerful this sequencer was with all this flexibility. The steps of the song show the number of times either a pattern is played during each step of the sequence. 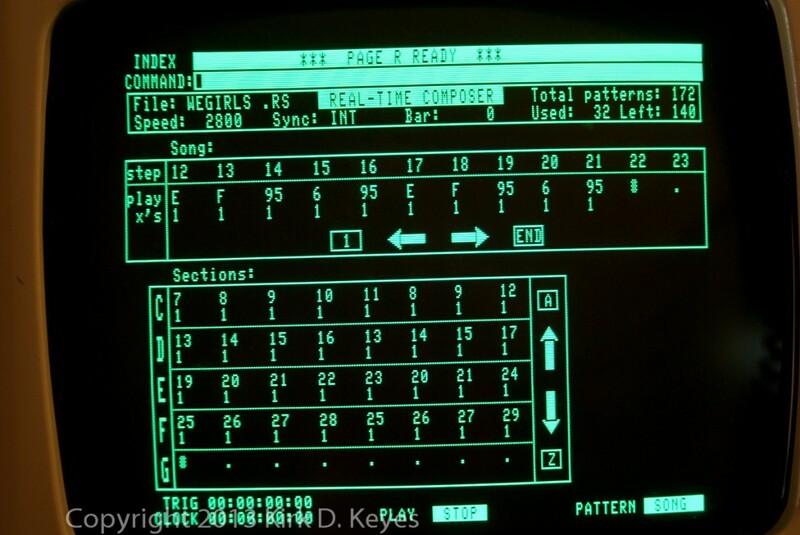 And the second half – showing sequence steps 12 to 21 and patterns C through F.
And here’s a chart the Fairlight shows to let you know how many patterns are used and were they are in case you need to remove some space from the Page R sequence file. Here are a few shots of different steps as the sequence plays. I have information on a second West End Girls disk here.